1 July 2012: Despite the weather having been so dire, we have managed to push decent amounts of energy down below, about as many or more than in the same time period last year. 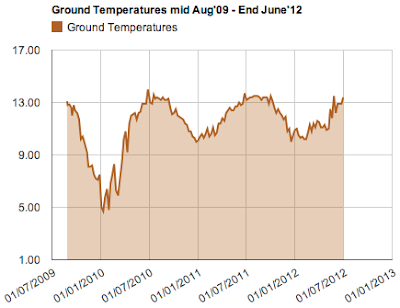 The ground temperature was tested and is 13.4ºC, about as hot as it gets in any normal summer. 2. partially that it was cold enough to keep the GSHP heating for longer, which always helps to draw more energy from the Sunbox. 3. I haven't lifted the manhole cover to the manifold for a while, but the good temperature also hints that more energy may be going down if the manifold stays dry. From 10 May to 1 July 2010: 601 kWh (SB). [PV 891 kWh], Must have been a good summer! The graph above shows how strange the spring temperatures have been.